In state of uttar pradesh posts of assistant professor, and principal for aided degree colleges of UP is filled by Uchchatar shiksha ayog. 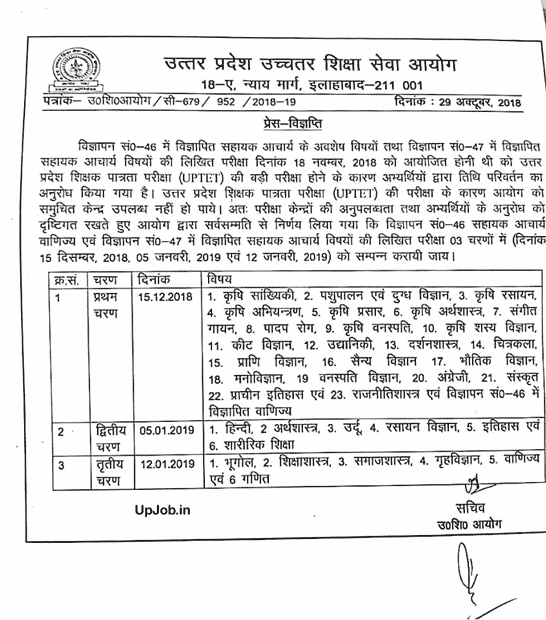 Posts of Assistant professor for government degree are filled by UPPSC uttarpradesh Lok seva ayog. Recently UP higher education selection committee published the notification for inviting online application form for 1150 posts. Selection for the posts of UPHESC assistant professor posts / Pravakta bharti will be based on through the written examination followed by personal interviews test. Written examination of UPHESC for different subject will be conducted on 18 November 2018. All those candidates who will be declared qualified in the written examination they will be call for personal interview. Selection merit list / cutoff list will be prepared on state level for all aided degree colleges of Uttar pradesh. Commission will also publish the answer key of UPHESC examination. After resolving all the objection commission will publish the results of Assistantprofessor examination. Its expected that results will be declared in the month of end of march 2016. Very good news coming for those candidates who are Post graduate and NET examination qualified. UPHESC now published official recruitment notification विज्ञापन सं0 47 for filling 1150 posts of assistant. www.upJob.in publish this advertisement here with complete details and information about this vacancy. We have already published the this news regarding Upcoming vacancy by Uchchatar siksha Sewa chayan ayog assistantprofessor bharti for mahavidyalaya. total no of vacancies are 1150 including various category for different subject. Post graduation degree in concerned subjects with at least 55% marks. UGC NET exam qualified / UP SET or SLET qualified. NET / SET / SLET is one of the essential qualification for filling posts of assistant professor. 5% relaxation in education qualification will given for reserved category of the candidates. Selection procedure: selection of the eligible candidates will be done through the written examination follower by personal interview test. Written examination for all subjects will be held at various examination centre of uttar pradesh. All those candidates who will be declared qualified in the written examination they will be call for personal interview test. Application form will be filled online only.. No paper application form will be accepted. Application form fee ; rs 2000 for general and OBC category candidates rs 1000 for SC / ST category candidates . Candidates are required to deposit application form fee via bank Challan form. Candidates have option of paying application form fee through credit card, debit card , PNB net banking, other bank net banking . Application form fee will be deposited in any branch of PNB . rs 1 will be extra payable as bank charged . Retain commission copy of Challan form, printout of application form safely and it will be submitted at the time of interview.